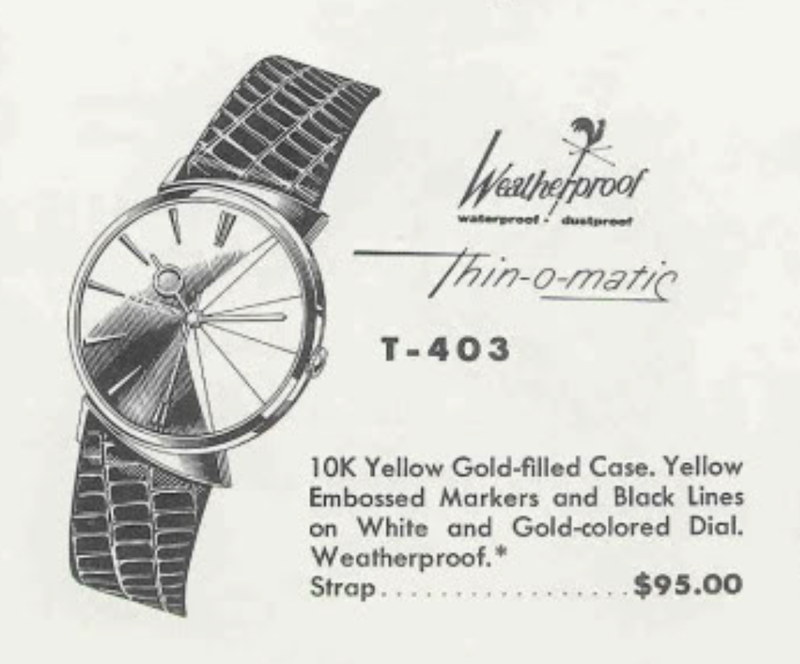 Asymmetric models are among the most sought after and popular watches in Hamilton's 1950's and '60's era. There are Electric, manual wind and automatic wind models with asymmetric cases. Even the Thin-o-matic line has a couple... one of them is the T-403. This model was produced from 1960 through 1963. The T-403 reminds me of a shark, probably because of the swooping shape of the lugs. It also has a "War of the Worlds" look to it, if you look at it from the side. It definitely has very unique styling that you'll only find in this era. In 1962 the model was offered with either a yellow or white gold filled case. Oddly, the white gold filled model didn't get white (silver) markers and hands - it had yellow hands. The yellow version has yellow markers but black hands... go figure. 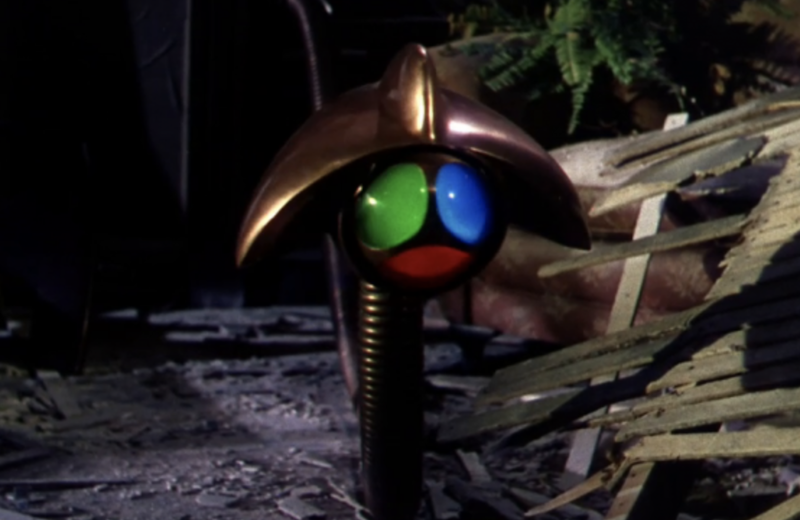 Its also interesting to note that the 1962 version was less expensive than the model when it was original introduced. You don't see that very often. My T-403 project watch came to me courtesy of a fellow collector. He has some fantastic examples and often shares some rare pieces with me - which is great because that means I don't have to find them in the wild. As received, you can see it's the white version so it's either from 1962 or 1963. The crown is not original and some moisture has gotten inside but otherwise it appears to be in good condition. The back is flat and since the watch does not say Automatic or Thin-o-matic on the dial, you wouldn't really know if this is a manual wind watch or an automatic. The overall shape of the back is a classic Thin-o-matic contour. I use a special tool to separate the two-piece stem and pull the crown out. Do you think a little moisture has gotten inside? I would say, yes, most definitely. I hope the rest isn't a mess. If you're curious what tool I use, it's not very complicated. It's just a tiny pry bar. Next I'll pull the crystal with my crystal lifter. Notice the evidence of water droplets inside the crystal. It's also a bit beat up and my friend included a new crystal, so this will be replaced. Phew! The rest of the movement looks good. Only the stem shows some rust, the rest is fine. Of course, once I pull the dial and hands, I might find more rust on the other side. This watch is long overdue for a cleaning - look at all the funk inside the case! It's funny how there's a dramatic line of crud on the dial right where the white and dark sections meet. The finish on this dial is probably compromised by the moisture so I will not try to clean it. It's also interesting to note that there are only hour makers from 6 to 12... really funky design, don't you think? It looks like the rust was limited to just the stem. That's very fortunate. While all the parts are in the cleaner, I'll get the new crystal ready for installation. I suspect a 31.1 PHD style crystal would be a suitable alternate. I think I see how some moisture gets into the case - there's a hole in the joint between the stem tube and the case. Micro-rotor movements can be a pain to reassemble and they definitely aren't good projects for a novice. Eventually all of the parts go back on and the watch is ticking away on the timer. It's running a bit fast but you can see the regulator (above) is set toward the fast side. I will move it back to the center. There... not too shabby. I might tweak it up a little more, to say, 15 seconds fast per day. That way when it settles down it will be spot-on. WOW! What a trip to the spa makes! It's hard to believe that the watch below is the same watch I started with. The dial is still a little dirty but some of the funk is gone. The hands are clean and the crystal is spotless and that helps a lot. This is an uncommon watch and I'm glad I've finally gotten to tackle one. One could acquire an impressive collection of Hamilton watches by just focusing on "one year wonders", or models made for just a single model year. There are quite a few of them. The reasons for one year wonders are a mystery but the logical guesses would be either they were unpopular and didn't sell well, the movement inside became obsolete, they were disrupted by something more significant, or they were an experiment with a new material or design. I suspect there are plenty of examples of all of the above but not being popular probably isn't a bad guess. A better way of saying "unpopular" might be to simply say unremarkable. Being unpopular doesn't mean being unliked, it could just mean unknown or otherwise indistinguishable from everything else. 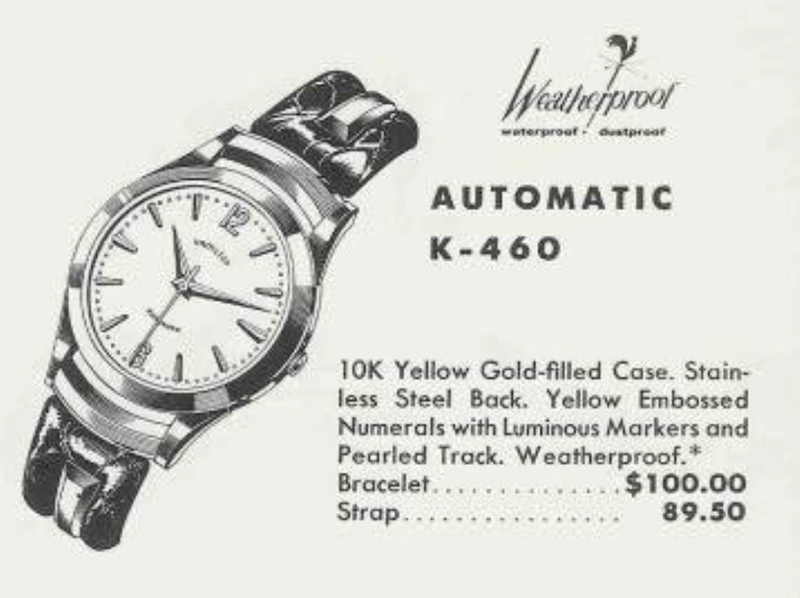 Take for example the 1960 Automatic K-460. It was made only in 1960. I wouldn't say that it's an unattractive watch or even unlikable in any way. However, it does look like a lot of other models so if it wasn't included in the lineup you probably wouldn't miss it. It came on a strap or on a bracelet and the bracelet was also used by several other models. Yes, I think having a K-460 in the collection would be great. Especially if you wanted to focus on rare watches that most collectors wouldn't have in there collections. My K-460 project watch came to me courtesy of a friend and fellow Hamilton collector. It arrived in well preserved state. There are a couple of minor dings here and there from wrist wear but it looks in great condition for pushing 60 years old. The back of the watch is stainless steel and clearly marked Hamilton. The curved spring bars are the original design. Tucked inside the case is a 17 jewel Hamilton 667 movement. This caliber replaced the 661 that was used in the earlier Automatic K-series models. Everything is completely disassembled and ultrasonically cleaned before being reassembled with a variety of fresh lubricants. The partially reassembled movement is now ticking away with good motion. Now it's time to see what the watch timer thinks of the ticking. Not too shabby at all. I might slow it down a smidgen but it will also settle down a little on it's own after a while. This watch came with it's original Kreisler bracelet and the original spring bars complete the assembly with a level of precision that surely must have been intentional. Everything fits together perfectly. This watch still shows just a tiny amount of wear but it's close to museum quality, in my opinion. One of the first Hamilton wrist watches I bought was an Endicott. It's also one of the first models that I put on the bog when I started this in 2012 (over six years ago!). The Endicott is one of my top favorite models and I always notice them when they're for sale and take a run at them when they are priced right. The Endicott was made for several years, starting in 1938 and going through 1948. It has five different dial options and I thought I'd do a post on what I consider to be the rarest dial pattern for the model... the first generation applied gold numeral dial. In 1938 and 1939 the Endicott had black enamel numeral dial or an AGN dial. The AGN version has black rectangles at the 5 minute marks. It was introduced in October of 1938. In 1939 the same AGN pattern was offered along with the black numeral dial and a luminous pattern was also introduced. In 1940 the black zone (and gilt) dial was introduced and if you look closely the AGN dial changed slightly to having black triangles at the 5 minute marks. So by this time there were four dial options to choose from. I believe the original AGN pattern with the black rectangles is the least common. In fact, I've only ever seen 3 or 4 since I started collecting. Hamilton records indicate there were 5 Coral Endicotts plus 1 solid gold Coral Endicott produced - so really there are six dial patterns out there but good luck finding a Coral one! Over the years I've sold four of the Endicotts to a fellow collector who appreciates the model as much as me. The only one he didn't have is the original AGN dial. I happened to see one on eBay recently and he purchased it, then he sent it to me to restore for him. As received it's not too bad. It's a little dirty but nothing too concerning. One of the ways to tell a good Endicott from a great Endicott is to look at the case back. A good one will show some wear to the lip of the back where a case knife can open the watch. A great Endicott will not show wear and this is a great Endicott. It will clean up very nicely. This dial appear to be original and it's a two-tone white/butler finished pattern. The numbers on this dial are closer to the center than on the later AGN dial so you cannot finish this dial pattern on the later dial - the number will run into the minute track. The hands on the dealer version are also a little shorter than on the later version. The only thing not original on this watch is the crown, it's white in color and would be great for a white gold filled model but the Endicott should have a yellow crown. This is an early 987A, just as it should be for an early Endicott. At this point in time Hamilton still included recesses for case screws to secure the movement in a three-piece case. Some of the early 1930's models with three-piece cases were still being made by the late 1930s. The back of the dial has no marks whatsoever, another sign that it's original. The mainspring inside the barrel is a typical blue steel spring. I'd wager that it's "set" and has lost most of it's energy by now. Yup - the spring expands to about the size of a quarter. This watch would probably run about 12-16 hours on a full wind, if that. I'll put in a nice white alloy Dynavar spring - that will power this watch for upwards of 40 hours. The now clean and reassembled movement is ticking away with good motion. I decided to go for it since I have a spare balance if something bad happens. The beat error is caused by the balance not being centered on the pallet fork. To correct it you have to remove the balance and rotate the hair spring how ever far is needed to center the balance. Normally it's just a few degrees one side or the other. It's not always easy to see which way it needs to go so you have a 50% chance of being right. As you can see below, on my first attempt I chose poorly - and the beat error increased. Now I have to do it all again and rotate the spring the other direction and then a little more. There... nailed it. A couple of tweaks to the regulator bring all the numbers into more than acceptable levels. I realized I had another Endicott project watch lurking on my bench (I told you I found them hard to resist). In the shot below you can see the two different AGN patterns, the placement of the numbers and the differing lengths of the hands. Only the cases are the same. My project watch turned out pretty good I think. The dial is almost 80 years old so you should expect a little aging, no? I think it looks excellent and no my friend will have a complete set of Hamilton Endicotts. We've been looking for this one for at least a couple of years, I think. It is not an easy watch to find.